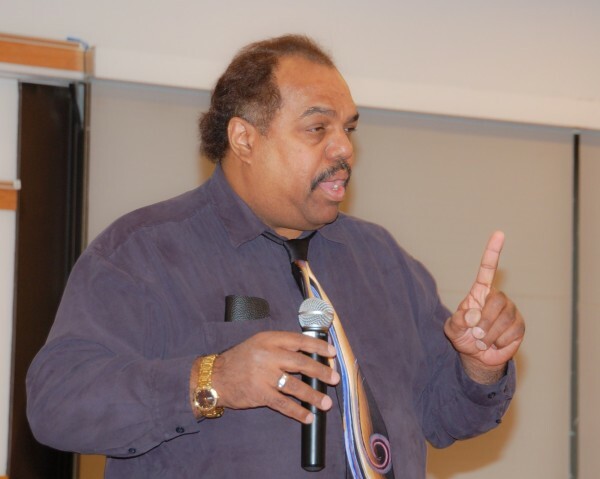 Daryl Davis is a black man who was able to befriend members of the Klu Klux Klan (KKK). On Wednesday Feb. 8, he delivered a talk to Salt Lake Community College students. To read The Globe’s preview of the event, click here. About 60 students were in attendance for the talk. Davis delivered a powerful message to the audience. “Ignorance breeds fear; fear, if you don’t check it becomes hatred; hatred brings destruction,” says Davis. Davis is a professional musician, who has also written a book titled Klandestined Relationships. It was through interviewing members of the KKK for this book that Davis gained friendships with some of the members. Davis has developed some notoriety from his book and from these unexpected friendships. Davis was featured on CNN Sunday Morning, where they followed him to a Klan rally. This story highlighted his relationship with Roger Kelley who was an official with the KKK. Today, Kelly is no longer a member of the KKK, and Davis has Kelly’s Klan robe in his possession. Along with many others, he is planning on opening a museum someday. “No matter how shameful, these are part of American history,” says Davis.